Trying To Lose Weight? Check This Out! You are here: Home / Weight Loss / Trying To Lose Weight? Check This Out! If you are trying to lose weight, you might want to check this out! I know a lot of people decide that the beginning of a new year is a good time to finally drop the extra weight. BUT, that said, I did buy a scale! I weigh everyday, sometimes more than once. Now, what I didn’t own when I gained all the weight and kept it on – was of course, exercise equipment AND a scale! That weight crept up on me and when I finally came to the realization it had to come off, I had NO idea how much I had gained – I was truly shocked at my weight. I firmly believe if I had been weighing myself, I wouldn’t have gained the weight at all! 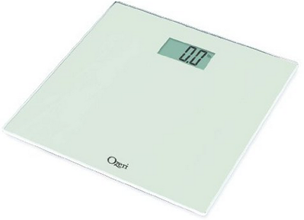 So, IF you are going to lose weight this year – I recommend getting a scale and weighing often. This one is just $12.95 right now down from $44.99! That’s a great deal! You can also get FREE Super Saver Shipping with orders over $25! Finish Jet Dry Powder – Just $2.60 Shipped! Wii Remote Dual Charging Charger Dock Station –Just $7.20! Is there more to your story after the Dr Oz part? If there is I can’t find it…interested in reading the rest of your story & how you did it. I have written a few posts about it. If you look on my right sidebar and find my Categories Pull Down Menu a little over half way down the page and you can Look for the Weight Loss category and they are all in there. Let me know if you have any questions or are having any problems finding them! Dian, I am not seeing the Category pull down. I would really like to read about your weight loss success.